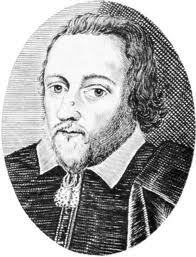 Playwright Philip Massinger was born in 1584 so was twenty years younger than Shakespeare. He died aged 56, in 1640, and had a longer writing life than most of his contemporaries. A prolific and popular playwright, he followed in Shakespeare’s footsteps and became the main writer for the King’s Men after the death of his friend, John Fletcher, who succeeded Shakespeare in the role. Like most Elizabethan drama writers of the time Massinger collaborated with other writers, including John Fletcher, Francis Beaumont, Nathan Field, Thomas Dekker, Thomas Middleton and William Rowley. Some scholars believe that he was involved with Shakespeare and Fletcher in the writing of Henry VIII, and there is evidence that he edited some of the sections written by Fletcher. Massinger’s solo plays are highly regarded and many of them are still regularly performed, including A New Way to Pay Old Debts and, particularly, The Roman Actor – which was one of the most performed plays of the Jacobean period. Massinger’s father worked in the household of the Earl of Pembroke, who impressed with Philip’s potential, entered him at St Alban Hall in Oxford and paid for his education for four years. However he left without taking a degree because he displeased the Earl by being more interested in literature than in science. Massinger then went to London and met John Fletcher who became a lifelong friend: they worked together until Fletcher’s death in 1625 and ended up writing more than twenty plays together. Fifteen years later, after having served that long as chief playwright at the Globe Theatre, he was buried in his friend’s grave in Southward Cathedral. He died in mysterious circumstances, being found dead in his bed with no apparent cause of death. The list of plays he wrote and was involved in writing is impressive. Like Shakespeare’s, Massinger wrote plays that were gripping: he was influenced by Shakespeare and studied Shakespeare’s techniques of plot development closely, so a new play by Phillip Massinger was an event to look forward to. Unfortunately, many of his plays were lost, including eight accidentally destroyed by a cook. Shakespeare’s Death: How Did Shakespeare Die? Sir William D’Avenant – Shakepseare’s Illegitimate Son? How Was Shakespeare’s Name Spelled? Pictures & Portraits of Shakespeare: What Did Shakespeare Look Like?